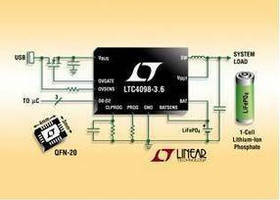 Supplied in 3 x 4 x 0.75 mm package, LTC4098-3.6 diode controller and battery charger for 1-cell Lithium Iron Phosphate (LiFePO4) batteries in portable devices features switching topology with PowerPath(TM) control. IC can interface with external switching regulator and has onboard switching regulator that can automatically limit input current for USB compatibility. Supplementing preset 3.6 V charge voltage with accuracy of 0.5%, product accommodates 1.5 A charge current when wall powered. Low Profile (0.75mm) 20-Lead 3mm x 4mm QFN Package About Linear Technology Linear Technology Corporation, a manufacturer of high performance linear integrated circuits, was founded in 1981, became a public company in 1986 and joined the S&P 500 index of major public companies in 2000. Linear Technology products include high performance amplifiers, comparators, voltage references, monolithic filters, linear regulators, DC-DC converters, battery chargers, data converters, communications interface circuits, RF signal conditioning circuits, µModule® products, and many other analog functions. Applications for Linear Technology's high performance circuits include telecommunications, cellular telephones, networking products such as optical switches, notebook and desktop computers, computer peripherals, video/multimedia, industrial instrumentation, security monitoring devices, high-end consumer products such as digital cameras and MP3 players, complex medical devices, automotive electronics, factory automation, process control, and military and space systems. LT, LTC, LTM, µModule and are registered trademarks and PowerPath and Bat-Track are trademarks of Linear Technology Corp. All other trademarks are the property of their respective owners.